Calling all Socialpreneurs located within the Antrim and Newtownabbey Borough Area. 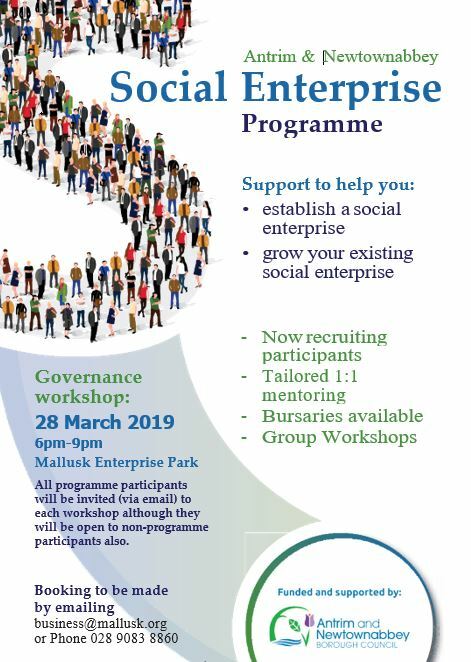 We are hosting a free workshop on Thursday 28th March 2019, from 6pm to 9pm, which will be beneficial for all new start social enterprises that are still deciding on their governance structure. It will give you the opportunity to ask questions and get clarification on what will work best for your organisation and listen to the experiences of other people in the room on a similar journey. For more information and to book please contact Sandra.Young@mallusk.org or call 028 90838860. The event is part of the Social Enterprise Programme which is funded by Antrim and Newtownabbey Borough Council.